I have finally received an official response from the State Government following my letters to Premier Anna Bligh and Minister Rachel Nolan. However, the response has come from lower down the chain of command, highlighting just how important an issue this is for the State Government. NOT! While the response says a lot, it says nothing too. It goes nowhere near answering the question of what will be done to improve the facilities in the Townsville region. 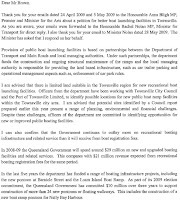 Please take your time to read the Governments response and leave your comments below. I can assure you I will be responding to this letter and conveying my disappointment.